I have just signed up to the worldwide movement to promote buying pork from real farms, not animal factories - farmsnotfactories.org. But it should be about all farmed animals-beef, sheep and chicken too. When animals have happier lives in non- intensive conditions and are reared by farmers who care about their welfare, the meat is healthier too. A ground-breaking new study, published this week in the British Journal of Nutrition, finds clear nutritional differences between organic and non-organic meat and dairy products. It discovered around 50% more beneficial omega-3 fatty acids in the organic meat and dairy products. It is higher in antioxidants and the fat from grass fed animals is rich in the right balance of omega 3’s to omega 6’s and an excellent source of vitamins and minerals. A small amount of lean meat is rich in some of the vitamins which can often be hard to obtain, such as vitamin B12. And, at this time of the year when we are short of sunshine, it’s a good source of vitamin D, which is present in fat from grass fed outdoor reared animals. The Soil Associtaion has more information about organic nutrition here. Our son who works in the land team at River Cottage HQ went on a nutrition course there recently and had lots of interesting information, particularly about the different fats and oils and how they change under temperature, and the need to use the right oil or fat for each purpose. As they say, healthy eating should be a celebration of real ingredients, not about deprivation! 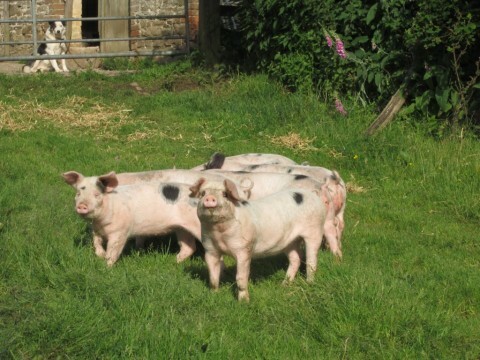 I'll be delivery a whole pig down to River Cottage later this month for their Pig in a Day course if you want to find out how to butcher a pig and do it all yourself.